The Echo Show has a seven-inch screen and video calling capabilities, among other new features. Updated from 10:06 a.m. with additional information. Amazon (AMZN - Get Report) wants users of its popular Echo digital assistant devices to be able to use more than just their voice. On Tuesday, the tech giant released the touchscreen-equipped Echo Show, the latest iteration of their rapidly growing line of digital assistant devices. The $299.99 device -- available for pre-order now and shipping June 28 -- comes in black and white and is equipped with a five megapixel camera and high-grade Dolby speakers. 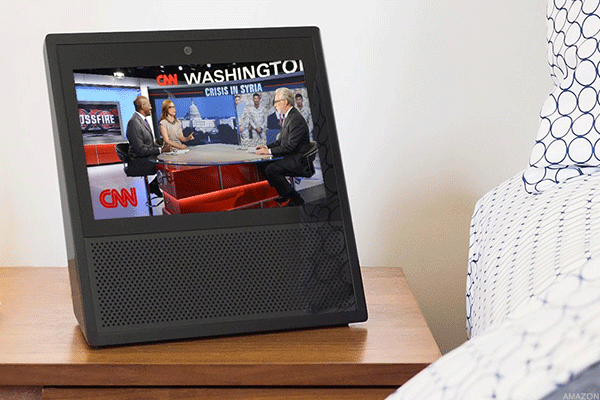 Like other Echo devices, the Echo Show comes with Amazon's Alexa voice assistant technology, but the screen adds a new layer of functionality to basic skills by allowing users to view video flash news briefings, YouTube videos, music lyrics, security camera footage, weather forecasts and more. Shares of Amazon were increasing 0.8% to $956.84 on Tuesday morning following the announcement and are up 27% year to date. The Echo Show's microphone is located on the top of the device, along with volume buttons and a button that turns the microphone or camera on and off. Along with the Echo Show, Amazon on Tuesday introduced a new calling and messaging feature that allows users of any Echo device to call or message anyone else with an Echo device or the Alexa App and not just those with the Echo Show. When an Echo device receives an incoming call, a green ring of light will appear and users can choose to answer or ignore the call. The feature operates using Amazon Web Services' Chime technology, which allows for video and voice calling, as well as messaging. Amazon late last month released the Amazon Echo Look, a hands-free camera and style assistant that allows users to take and share photos of their outfits, as well as get recommendations for what to wear. Like Amazon's other digital assistant devices, the Look also responds to voice commands for tasks such as giving a weather forecast, controlling smart home devices and playing music. The current standard Echo device costs $179.99 though it's on sale now for $149.99, while the portable Amazon Tap goes for $129.99 and the smaller Echo Dot costs $49.99. Editors' pick: Originally published May 9. The Echo Show allows users to view video flash briefings from CNN, as well as other content. The new Amazon Echo Show. Images of the device leaked last week by VentureBeat reporter Evan Blass, and a Wall Street Journal report published on Monday that cited sources familiar with the matter noted that the device would have a seven-inch touchscreen with a front-facing camera for applications such as video calling. Rumors began to circulate about a touchscreen Echo device as early as last November, when Bloomberg said Amazon was developing a premium digital assistant that tilts upwards for easy viewing and is packed with high-grade speakers that make it sound better than current Echo devices. Both the Look and the Echo Show represent a departure from the cylindrical design that was a hallmark of prior versions of the Echo. They also signify Amazon's push to stay ahead of newer rivals such as Alphabet's (GOOGL - Get Report) Google Home, Harman Kardon's voice-activated speaker powered with Microsoft's (MSFT - Get Report) Cortana and, to a lesser degree, Apple's (AAPL - Get Report) Siri. The Echo Show demonstrates Amazon's ambitions to enter every corner of the connected home, as well as expand the Amazon e-commerce ecosystem. Werner Goertz, an analyst at the technology research firm Gartner, said the device should open up new communication and e-commerce opportunities for Amazon. Goertz was able to get an early look at the Echo Show at a private Amazon demo last week, and said the company seemed to emphasize the device's consumer focus while also signaling that there could be some opportunities around enterprise communication down the line. "This is all about drawing the shopper deeper into the Amazon ecosystem," Goertz noted. "Previously, it was very cumbersome to provide a list of search items, like what movies are playing or menu items. This removes additional layers of obstacles for e-commerce." Goertz expects that Amazon will next introduce some kind of voice authentication feature that allows the Alexa digital voice assistant to distinguish one user from another. Google Home just released a similar feature late last month that also supports multiple accounts on one device. For Amazon to do the same across all of its Echo devices, the company might introduce different colored light rings to signify individual user accounts and voices, Goertz added. In some ways, the Echo Show also presents a new take on the tablet, a market which has recently turned lackluster, said Tom Goodwin, executive vice president at media firm Zenith. It should also open up a whole new slate of Skills, or commands, that the Alexa voice assistant can answer to, he added. The voice-enabled speaker space has grown rapidly as more consumers have gotten comfortable with using the technology to complete everyday tasks. A new report from eMarketer estimates that 35.6 million Americans will use a voice-activated assistant device at least once a month this year, which represents a nearly 130% increase over last year. Of those users, about 71% of them are using an Amazon Echo speaker, while 24% prefer the Google Home. The remaining 5% are using less popular products from companies like Harman Kardon, LG and Lenovo, among others. eMarketer expects usage of virtual assistants to increase 23.1% in 2017.